Scott Summers / Young Cyclops (played by Tye Sheridan) wears Ray-Ban New Wayfarer sunglasses in X-Men: Apocalypse. 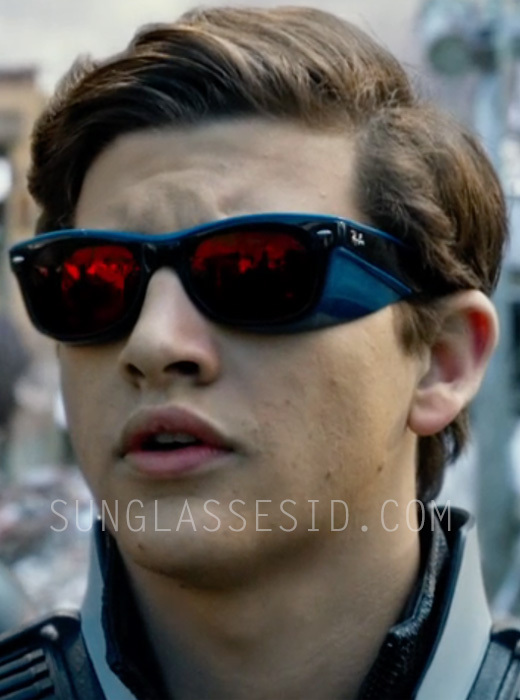 The character Scott Summers / Young Cyclops (played by Tye Sheridan) wears sunglasses similar to black Ray-Ban New Wayfarer sunglasses in X-Men: Apocalypse. The sunglasses have been modified for the film to become Young Cyclops visor, but have the Ray-Ban logo on the temples. The sunglasses have a black shiny frame, red mirror lenses. A very similar pair of sunglasses is the Ray-Ban New Wayfarer Flash red mirror lens, RB2132 622/2K 55-18. The New Wayfare is more smooth and rounded than the Original Wayfarer, one of the most popular frames in movies (see all Wayfarer sightings). The red lens model is available on Amazon.com for $130, or find the black Ray-Ban New Wayfarer with regular lenses at FramesDirect or SmartBuyGlasses.